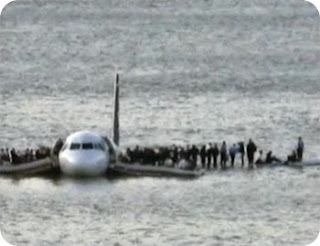 Flash games have been popular on the Internet for years, but rarely do you see them take on a serious subject like the Hudson river landing of flight 1549. Every one was amazed by the landing of the A320 in the Hudson river back on January 15th, and just slightly over 2 weeks later, there is a Flash based game that will let you try your hand at landing the plane yourself. You start your descent at around 1500 feet, and using just the left and right arrow keys on your keyboard, you attempt to keep the plane level for the inevitable splash down in the river. As games go, it is mediocre at best, I mean I successfully landed the plane on the first try, and even I thought my angle was a bit off. When I intentionally brought the plane in at a severe angle, I did indeed “lose”, but the animation still showed people piling out on to the wings with the plane sitting at a 180 degree angle in the water, with the nose straight up in the air. It’s amusing to play once, but it’s nothing you’re going to get addicted to. We’ve embedded it below for your convenience if you’d like to give it a try and see if you can perform your own Miracle on the Hudson. Click “Read More” to go to the game.